To get a better understanding of the option ideas expressed in this blog, buy my ebook today! I sold my 500th E-Book on July 5, 2009. Thank you to all my readers for purchasing my E-Books and reading my blog. I will continue to blog because of you! Even though demand for my E-Books seems high, I still want to make them affordable as possible and educate as many people about the option world as possible. I will continue to sell my option E-Books for rock bottom prices, and offer a 100% satisfaction guarantee! Lingo used in my blogs may seem frustrating at times, but once you understand the world of options it is as simple as 1-2-3. I have made some new updates to both E-Books to make them even simpler to understand and learn how to open and close the option positions. Options are growing at an extremely fast rate as you can see from the chart below. There is a reason for this growth. It is because they hedge your portfolio so well! As optimistic as I'd like to be, I do not know what the future holds. I do know that options are a great way to protect your portfolio against the volatile environment ahead. Learning to trade options was one of the best moves financially I've ever made, like explained in My Story. I was taught the step by step process when I was 16 years old and was able to build on the basics. I strongly believe if I was never taught to trade options step by step like shown in my E-Books, I would have never learned because I may have given up trying to digest some of the other material out there. Get involved with options today with my simplified option E-Books and save an addition 15% when you buy both together. I promise you'll easily understand my E-Books. I also recommend that once you have learned the basics of options you set up a live virtual account at OptionsXpress. This will help you develop your own strategies, and you'll be able to become more familiar with the pricing of options, risks, etc... Setting up a virtual account with "virtual funds" will ensure that you understand the basics of options, and is a great way to practice before trying options with real money. Buy Both of My option E-Books and SAVE over 15%! 100% Money Back Guarantee! Today's breakout report is for Wednesday March 24, 2010. If this is your first time reading one of my breakout reports you'll want to read the section below, however if you are familiar with my daily breakout report you should skip ahead to the list of stocks. To reiterate previous blog posts like this, the first thing I do is scan the list for familiar names, such as stocks I am quite familiar with or ones which have appeared on similar scans multiple times in the past week or two (most of these names are unfamiliar so it saves a lot of time). This indicates there may be some real momentum behind the stock, and that it could trade higher/lower in following sessions as well. Then (if and when any of the stocks I find are familiar to me), I make sure the stock has options available to trade, and then take a look at the chart(s) to see if I can structure a potential option trade. The list in this post includes 28 stocks which traded higher on heavier volume, and 19 stocks which traded lower on heavier volume Wednesday March 24, 2010. Many times I find an option strategy I plan on opening if I am convinced some money can be made. The tables below show the company, ticker, per share % increase, and volume increase (% increased compared to 50 day average). The first table is a list of potential bullish stocks, the second table is a list of potential bearish stocks. For your convenience I have ranked both tables in order from greatest to least volume % change. Out of the bullish list above, one stock which appeared Tuesday and multiple times in previous scans is Perrigo Company (PRGO). Before I get into any detail I will give a company summary from Google Finance below. Perrigo Company is a global healthcare supplier that develops, manufactures and distributes over-the-counter and prescription pharmaceuticals, nutritional products, active pharmaceutical ingredients, and pharmaceutical and medical diagnostic products. The Company operates in three segments: Consumer Healthcare, Rx Pharmaceuticals and API. The Company has other category that consists of the Israel Pharmaceutical and Diagnostic Products. The Company operates through wholly owned subsidiaries. In the United States, its operations are conducted through L. Perrigo Company, Perrigo Company of South Carolina, Inc., Perrigo New York, Inc., Perrigo Holland, Inc. and Perrigo Florida, Inc. Outside the United States, its operations are conducted through Perrigo Israel Pharmaceuticals Ltd., Chemagis Ltd., Quimica y Farmacia S.A. de C.V., Laboratorios Diba, S.A., Wrafton Laboratories Limited, Brunel Pharma Limited and Galpharm Healthcare Ltd.
Perrigo announced they were to acquire PBM Holdings, a private label baby food maker, for $808 million and was upgraded shortly after Tuesday, this caused the stock to spike higher, and the bullish price action continued Wednesday. I certainly believe the momentum for this stock is to the upside and if I was to ride the momentum in the stock I would consider getting long on a slight pull back and set a tight trailing stop loss. However I am considering opening a bullish option strategy which I will outline in detail below. Perrigo Option Strategy: I would like to see slight profit taking bringing this stock back down to earth before I get long, but if it happens to pull back I need to see it hold two days above the 54.20 level which it opened at on Tuesday following the bullish news. My ideal entry point would be around this level, but before entering I would need to see a bullish confirmation on the chart. The option strategy I am looking at structuring is a very simple one, and only requires the use of two option contracts and one expiration. I would look at purchasing April 55 strike call options and immediately selling April 60 call options against them (1 for 1). This strategy is currently in-the-money and using current data it is trading a slight discount to the shares which is not unusual for in-the-money vertical spreads. This position could currently be opened for a net debit of $265 per spread. Depending on where the stock trades from here will determine the premium/discount for this vertical call spread, but as of this data the spread is trading at a discount of 15 cents per share. As stated I would like to get into this stock after a slight pull back and a bullish confirmation after that, therefore if I do end up opening this strategy near my ideal entry point, I would surely be paying a premium to open this spread. Profit & Loss: The maximum loss from the example outlined above is limited to $265 per vertical call spread and will occur if Shares of Perrigo trade and close at or below 55 per share by April options expiration. The gain from this strategy is limited to $235 (or 88.7%) per spread and will result if shares of Perrigo close at or above 60 per share at April options expiration. The break even price per share is 57.65 at April options expiration. If I enter into this trade I will be monitoring my position based on the chart, as I rarely wait until expiration to close or allow my position to get exercised. As always, I will be updating the status of this trade in future breakout reports. This is a bullish strategy and should not be considered if you think the stock will sell off in the near future. 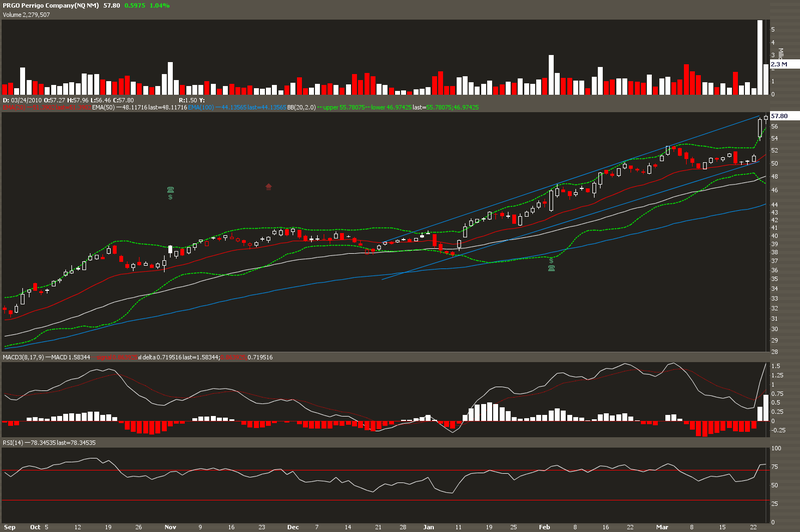 However if you feel the stock could move higher in the near future, this strategy could yield a nice gain. To get a better understanding of stock options and different option strategies please check out my Simplified Stock Option Trading E-Books. These are just examples and are not recommendations to buy or sell any security; if you're more bullish/bearish, you’ll want to adjust the strike price and expiration accordingly. The reason option volumes have surged in the last five years is because they are a great way to hedge your portfolio as well as create income off of your shares (see chart here). Keep in mind when using this strategy it is essential that broker commissions are low enough to profit from the position. As the market traded higher across the board Monday on lighter volume, there were many stocks which traded higher/lower on above average volume. Today's breakout report is for Monday March 22, 2010. If this is your first time reading one of my breakout reports you'll want to read the section below, however if you are familiar with my daily breakout report you should skip ahead to the list of stocks. To reiterate previous blog posts like this, the first thing I do is scan the list for familiar names, such as stocks I am quite familiar with or ones which have appeared on similar scans multiple times in the past week or two (most of these names are unfamiliar so it saves a lot of time). This indicates there may be some real momentum behind the stock, and that it could trade higher/lower in following sessions as well. Then (if and when any of the stocks I find are familiar to me), I make sure the stock has options available to trade, and then take a look at the chart(s) to see if I can structure a potential option trade. The list in this post includes 23 stocks which traded higher on heavier volume, and 12 stocks which traded lower on heavier volume Monday March 22, 2010. Many times I find an option strategy I plan on opening if I am convinced some money can be made. 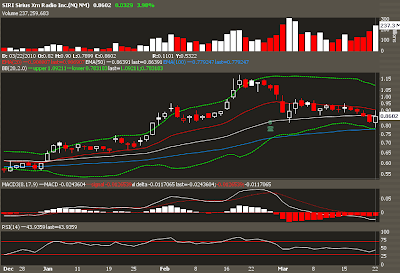 Out of the bullish list above, one stock I was watching all day Monday was Sirius XM Radio, Inc. (SIRI). Sirius opened Monday slightly lower than Friday's close and traded down to 79 cents before reversing the day to close higher by 3.98%. Most of us know about Sirius XM, but as always before we get into the chart details, I will give a company profile from Google (GOOG) Finance below. Sirius XM Radio Inc. has two principal wholly owned subsidiaries, XM Satellite Radio Holdings Inc. and Satellite CD Radio Inc. The Company is engaged in broadcasting in the United States, its music, sports, news, talk, entertainment, traffic and weather channels for a subscription fee through its satellite radio systems, the SIRIUS system and the XM system. On July 28, 2008, its wholly owned subsidiary, Vernon Merger Corporation, merged (the Merger) with and into XM Satellite Radio Holdings Inc. and, as a result, XM Satellite Radio Holdings Inc. became its wholly owned subsidiary. The SIRIUS system consists of three in-orbit satellites, approximately 120 terrestrial repeaters that receive and retransmit signals, satellite uplink facilities and studios. The XM system consists of four in-orbit satellites, over 700 terrestrial repeaters that receive and retransmit signals, satellite uplink facilities and studios. Looking at the chart below, we can see some rather bullish price action. To me, this price action signals short term strength; I was selling June put options as it ticked positive, and buying May call options near close when it was apparent of this bullish chart pattern. I wrote about Sirius XM in early March as I saw a similar reversal, and Sirius traded higher by roughly 10% following that post before retesting the lows of that reversal day on March 2. 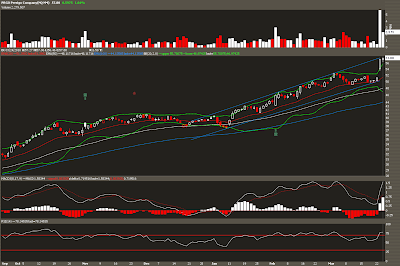 If I was strictly an equities trader I would get long Sirius XM here with trailing stop loss of about 5-6%. However I am more of an options trader, so I have outlined a strategy below which will put me into shares of Sirius for roughly a 7.7% discount and give me unlimited gains to the upside if it happens to move higher by May options expiration. Sirius XM Radio Option Strategy: This is a very simple trade to make and only require two different option legs. First I would look to sell in the money June 1 strike put options for a credit of $25 per contract. Note that if Sirius closes on June 19, 2010 below $1 per share I will receive 100 shares for each contract I am short. I would then look to purchase May 1 strike Call options for $5 per contract. This would put $20 (less commissions) into my account for each long combo position I got filled making my overall cost basis on each share of Sirius 80 cents (if it gets put to me). It is very important to note that I do not mind owning shares of Sirius at 80 cents come June options expiration. By purchasing the May call options, I will also capture unlimited gains beyond 1.05 per share by May options expiration. There is a rumor that March auto sales may be stronger than anticipated which would be a positive for Sirius, therefore there may be some increased buying in shares of Sirius going into that release on April 1, and will likely cause an increase in volatility which will cause the options to be a bit overpriced. It is important to note that I am looking to get long additional shares of Sirius for a slightly lower cost without losing upside potential, which is why I am using this option strategy. It is extremely important to note that this strategy is much less liquid than purchasing shares of SIRI and may not suit a very active trader. Profit & Loss: The maximum loss from this strategy will be $80 per long combo position and will be if Shares of Sirius XM trade to zero ($0.00) by June options expiration. The gain from this strategy is unlimited until May options expiration with profit increasing with each penny shares of Sirius trade over $1.05, the position can be closed at anytime or shares can be exercised at expiration for $1. After May options expiration the gain is capped to $20 per long combo position until June options expiration, with the maximum gain being if Sirius closes above $1. The break even per share price is 80 cents at June options expiration. I rarely wait until expiration to close or allow my position to get exercised. Learn How to Trade Options with Option Maestro's Simplified Option Trading E-Books. Read more about my E-Books here. A proven way to easily understand options - learn by actual examples. After reading this guide to trading options, you'll be able to pay for it by writing your first covered call! 100% Money Back Guarantee! Go beyond the basics, and learn about Advanced Option Trading Strategies. Learn about Call and Put Spreads, Option Straddles, and Option Strangles with Option Maestro's Advanced Option Trading Strategies E-Book. As always 100% Money Back Guarantee! Buy both today and SAVE 20%! 100% Money Back Guarantee! E-Book Download Problems? No Problem email me with Paypal transaction number, and I'll get you the E-Books emailed within 24 hours. Is Friday the 13th Good Luck for the Stock Market? I'm a trader of stocks, options, currencies, and futures. I've been fascinated with the financial markets ever since I bought my first stock at 11 years old. On my free time I like to trade and write about stocks and options. I'm dedicated to educate my readers to the best of my ability about the financial markets, particularly about buying/selling options and option strategies. I trade based on technicals and fundamentals, so you may find many of my posts valuable. 2008 was one of my best years for trading stocks and options, but that only motivates me even more to learn and create new strategies. If you'd like to know more about trading options and stock market strategies, subscribe or bookmark my blog. What made me passionate about business and investing. A look at my family's cheese business. DISCLAIMER: All data & information is deemed accurate but is not warranted or guaranteed. It is your responsibility to assess the accuracy, completeness and usefulness of the content of this site. All data, information, opinion expressed, or website links in this site is for informational purpose only, and is not intended to provide any recommendation to buy or sell a security or to provide investment advice. Nor this site endorses or recommends the services of any brokerage company. This site is not responsible for any losses or damages whatsoever that may be arising from any use of the content of this site or website links in this site. You are solely responsible for your trading outcomes or for any losses, monetary or others, which may be resulting from the use of the content of this site. You must do your own due diligence before committing any investment. Stocks and options involve risk so always be sure to use caution when buying or selling any type of security!